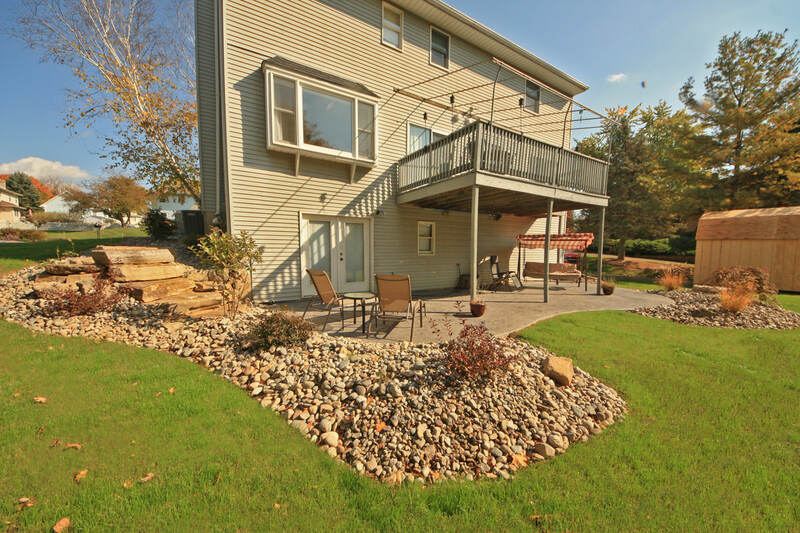 The backyard is mostly flat but there are areas around the house that have steep slopes. The front of the house is facing east, which means the front gets morning sun and the back gets afternoon sun. The front of the house has overgrown shrubs that are old and wildly looking. 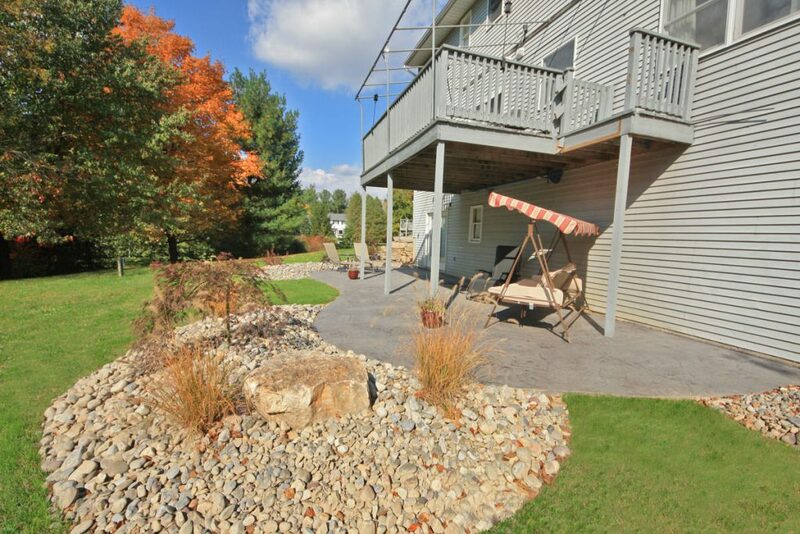 There is a 6’ high retaining wall in between the driveway and the front landscape that retains the soil. Our client wanted a wide patio with an area in the middle where they can put comfortable furniture for watching television off a projector. They wanted a modern style patio that matches the house and goes well with the surroundings. They initially called us about installing a patio but while discussing plans for a patio we also began to make plans for landscaping as well. 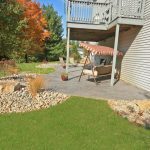 He wanted to create landscape beds that surround the patio and for around the house. 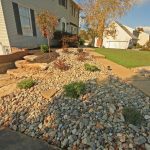 The main priority was easy maintenance with colorful plants and stone. We added a decorative concrete patio that expands almost the entire back of the house. We expanded the patio pretty far off the house in all directions to give it a modern look while also supplying the clients with the room they wanted for all of their entertaining needs. Landscaping was added to front of the house, the side, and around the patio. For the front of the house, our client wanted to keep an existing front walkway and stoop with the plans to add and front porch that extends to the corner of the house. We did not add foundation planting to where porch was planned to go. We left the existing Japanese Maple that will eventually get removed. We trimmed all around the Maple and made it look like brand new plant. Off of the house, past where the porch will end, we added a Crabapple that will have plenty of room to spread. The Crabapple helps frame the house with an existing Birch on the other end. For the remainder of the plantings, we used a variety of shrubs and perennials that would work well in the light and terrain conditions that the front of the house has. For the area where is slopes into the driveway we added boulders along the steeper area. 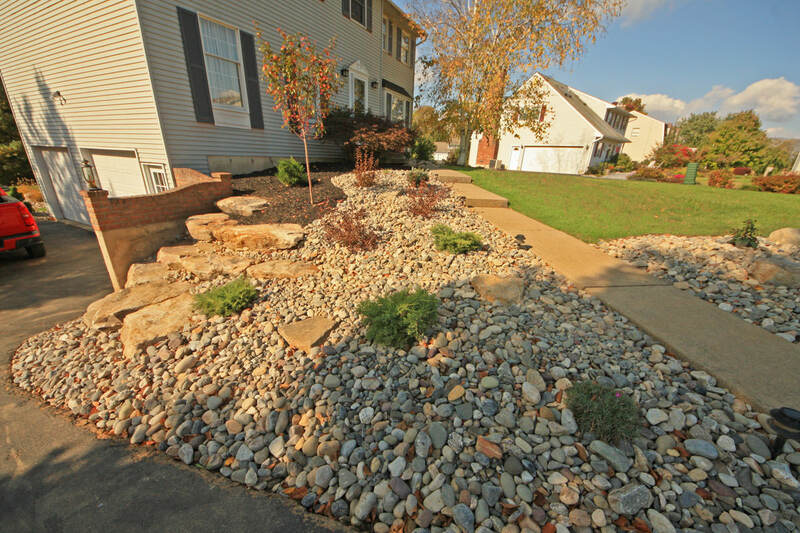 We used a combination of Delaware River Stone and Juniper to aid in retention. The remaining plants we used include Daylilies, Dianthus, Black Eyed Susan, Globe Spruce, Weigela, Geranium, Astilbe, Azalea, Hydrangea, and China Girl Holly. The landscaping continues down the shady side of the house where we added more China Girl Holly with a China Boy Holly, Andromeda and Hosta. We added boulders that extend down a sloped area that leads to the back. 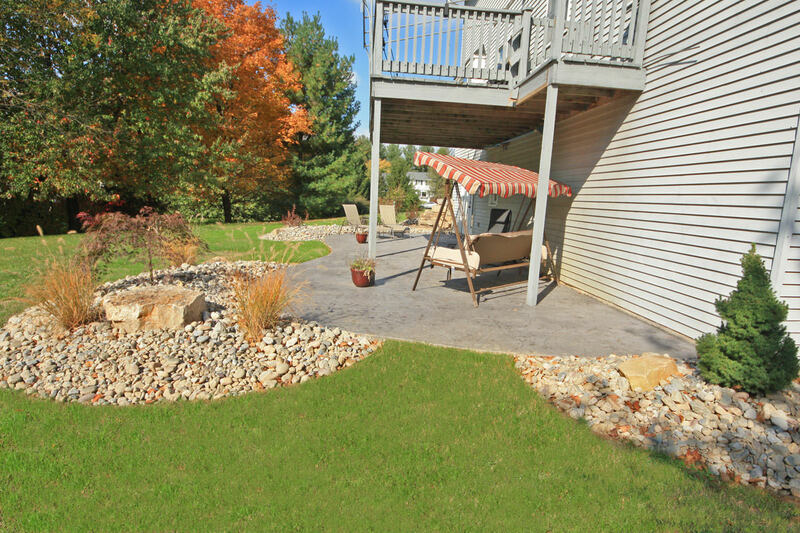 The landscaping for the back of the house was designed using sun loving plants that added color and movement. We left a wide entrance to the center of the patio because of plans for a future pool area. The plants we used include Viburnum, Weigela, Salvia, Coreopsis, Azalea, Ornamental Grasses, a Japanese Maple and a Dwarf Spruce. Even though there is not much slope except for down the side, we added Delaware River Stone for the bedding to match the front.